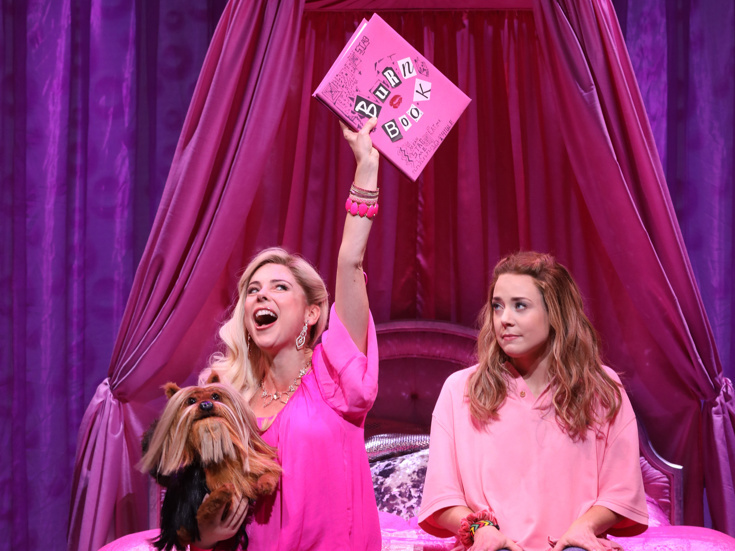 Kerry Butler & Erika Henningsen in "Mean Girls"
The new stage-musical adaptation of Mean Girls has officially arrived on Broadway, and audiences aren't missing the chance to see the colorful characters from the film favorite singing and dancing on the Great White Way. Featuring a book by the movie's screenwriter Tina Fey and a fresh score by Jeff Richmond and Nell Benjamin, this tuner has the makings of a Broadway success. In Mean Girls' first week of just seven performances at the August Wilson Theatre, the new musical played to completely sold-out houses and posted a box-office gross of $1,320,145.85. Mean Girls' official opening is just a few weeks away, so now is the time to book tickets to a show that will surely play to packed houses for years to come.